An allergic reaction is an excessive response from your immune system to a medicine, chemical, food, insect bite, or other substance. A reaction can range from mild to life-threatening. Some people have a mild rash, hives, and itching or stomach cramps. In severe reactions, swelling of your tongue and throat can close up your airway so that you cannot breathe. If you know what caused your allergic reaction, be sure to avoid it. Your allergy may become more severe each time you have a reaction. 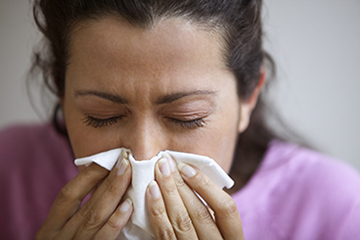 Take an over-the-counter antihistamine, such as loratadine (Claritin), to treat mild symptoms. Read and follow all instructions on the label. Some antihistamines can make you feel sleepy. Do not give antihistamines to a child unless you have checked with your doctor first. Mild symptoms include sneezing or an itchy or runny nose; an itchy mouth; a few hives or mild itching; and mild nausea or stomach discomfort. Do not scratch hives or a rash. Put a cold, moist towel on them or take cool baths to relieve itching. Put ice packs on hives, swelling, or insect stings for 10 to 15 minutes at a time. Put a thin cloth between the ice pack and your skin. Do not take hot baths or showers. They will make the itching worse. Your doctor may prescribe a shot of epinephrine to carry with you in case you have a severe reaction. Learn how to give yourself the shot and keep it with you at all times. Make sure it is not expired. Go to the emergency room every time you have a severe reaction, even if you have used your shot of epinephrine and are feeling better. Symptoms can come back after a shot. Wear medical alert jewellery that lists your allergies. If your child has a severe allergy, make sure that his or her teachers, babysitters, coaches, and other caregivers know about the allergy. They should have an epinephrine shot, know how and when to give it, and have a plan to take your child to the hospital. Sudden raised, red areas (hives) all over your body. Swelling of the throat, mouth, lips, or tongue. Passing out (losing consciousness). Or you may feel very light-headed or suddenly feel weak, confused, or restless. You have been given an epinephrine shot, even if you feel better. A rash or hives (raised, red areas on the skin). Belly pain, nausea, or vomiting. Enter E081 in the search box to learn more about "Allergic Reaction: Care Instructions".